The year was 2011. Adele’s “Rolling in the Deep” topped the charts with Katy Perry hits “E.T.” and “Firework” not far behind, NASA announced that it had found possible evidence of water on Mars and only one team made the wild card in each league. Now fast forward to 2015. Katy Perry continues to produce jams while Adele is about to drop a new album, NASA once again tells us about evidence of water on Mars (but until I see a bottle of Aquafina, I call B.S.) and there are now two wild card slots per league. Am I excited for the new Adele album? Yes, who isn’t. But am I even more excited about the Pittsburgh Pirates and Chicago Cubs squaring off in a one game playoff? Hell yes, and you should be too! First, look at the match-up of Jake Arrieta against Gerrit Cole. In 2011, Jake Arrieta was 25 years-old with an ERA over five and a WHIP around 1.50. He struck out just 93 hitters on his way to a ten win season with the Baltimore Orioles. In 2015, Arrieta is a contender for the NL Cy Young Award with 239 strikeouts, an ERA under two and a WHIP of about .85. His ERA for the second half of the season has been under one, and he ended up with 22 wins during the regular season. In 2011, Gerrit Cole was a 20 year-old out of UCLA, selected as the first overall pick the Pittsburgh Pirates. He received a multi-million dollar contract and did well enough in Arizona’s fall league to earn an invitation to spring training in 2012. In 2015, he has lived up to being the number one pick with nineteen wins, over 200 strikeouts and an ERA of just above two-and-a-half. The two have mastered their crafts this season (albeit, it took Arrieta a little longer to mature than Cole), and having them square off against one another in a do-or-die game should live up to the hype. If the pitching matchup, somehow, isn’t enough to get you excited about this game, then how about some of the young stars in these lineups? Theo Epstein was criticized for taking Kris Bryant in the 2013 draft with the Cubs first pick. Many fans wanted a pitcher, not a corner infielder. In 2015, a Kris Bryant jersey is the top selling uniform in baseball. He has been a spark plug for Chicago in the middle of the lineup, with almost 100 RBIs. Anthony Rizzo had another solid year for the Cubs, finishing with over thirty homers for the second straight season. Rizzo also set a career high with over 100 RBIs. Pirates’ catcher Francisco Cervelli has adjusted nicely to life away from the New York Yankees. The 29 year-old played in just 69 games in 2012, 2013 and 2014 combined. In 2015, Cervelli featured in 130 games and hit just under .300, giving the Pirates a reliable backstop with a consistent bat. At 28 years-old, Andrew McCutchen still has some great years ahead of him. His average dipped below .300 this year for the first time since 2011, but he is still the backbone of this Pirates offense, and he consistently knocks in big runs from the center of the lineup. If you still aren’t convinced that this game is a must-watch for all sports fans, then think about what this game means for both these teams. Pirates and Cubs fans have spent the last decade watching (mostly) horrible baseball teams while their rivals, the Cardinals, had nothing but success. Now these two sides play with the winner getting a shot to take down their nemesis in St. Louis. The Cubs last World Series was 1908. I have no idea what life was like back then, but I do know Arizona still hadn’t become a state (there were only 46 at the time). The last pennant victory was in 1945. While there were 50 states then, it is still a long, long time ago. The Pirates last World Series was 1979. The last pennant? 1979. This was the year of the first McDonald’s Happy Meal and the launch of ESPN. People still listened to disco and cocaine was a totally normal thing to do in the middle of a bar. These fan bases have suffered for a long time, and now in 2015, they have the pieces to do something special in the playoffs. The Pirates had the second most wins in the majors this season (98), and the Cubs had the third most (97). 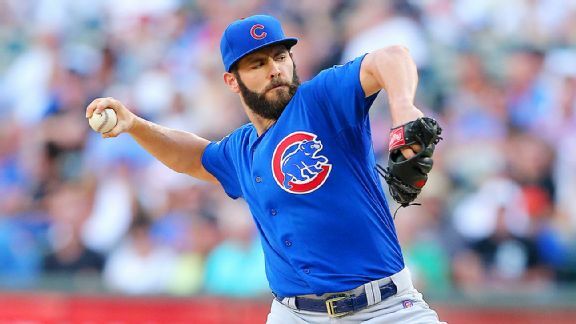 I predict the Chicago Cubs in this one, simply because of Jake Arrieta’s dominance since the All-Star break. When these two teams met about a week ago, Arrieta gave up just one hit in the entire game. Gerrit Cole is no slouch, so I expect a tight game until around the sixth or seventh inning, when one of the young Cubs gets a big hit to give Arrieta just enough to win. I also like this Cubs team to go deep in the World Series. Back To The Future II predicted Chicago would win the championship this year Theo Epstein is the curse slayer. And this team has great defense, stellar pitching and just enough offense to finally break the curse.